A fair amount of caution should be taken when navigating the historical paths of iconic Thai dishes. These dishes are almost always associated with the perception of one’s home and family; they bring up memories of our mothers’ and grandmothers’ kitchens, and they generate strong emotions about what is genuine and what is authentic. In our ongoing process of rectifying misconceptions and untangling connections; in redefining the concepts and boundaries of dishes; and in rehabilitating ancient recipes and forgotten flavors to achieve a contemporary sense of the primal taste and emotions it might evoked, we immersed ourselves in the kingdom of nostalgia. Burrowing deep into our archive of old books – with yellowing pages and musty smells, we brushed off the dust and tried to bring black and white print into colorful images with vivid flavors and fragrances that illuminate the archetypal, living flavor of each dish. Living in a constantly changing world, with an intimidatingly wide choice of ingredients and recipes, we sometimes yearn to retreat to familiar flavors. The past provides us with the certainty of something that will never change; nevertheless, it is always imbued with its own context – and every bite into an old recipe also expresses our very own modern conception. 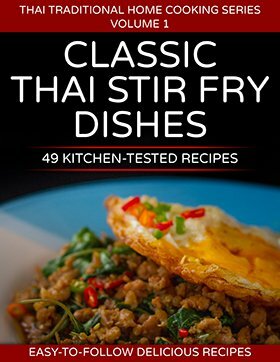 It is this style of gastronomic nostalgia – embracing ancient wisdom as well as a strong respect for history – that serves as a tool to explore the future of Thai dishes with familiar ingredients and culinary techniques: It allows us to invent something new within the dish’s traditional boundaries while remaining faithful to its past. We have chosen to pause and take a closer look at tom yum soup, a dish that has been present in Thai culinary culture from ancient times. The character, classification and spectrum of its ingredients have been adjusted over the years, but tom yum soup endures, a chart-topper among favorite Thai dishes. And, certainly, it will continue to evolve and adapt alongside our own dining habits and preferences. As it moves forward, the delightful memory of our favorite tom yum soup – whether we had it a decade or an hour earlier – lingers. But could we really find comfort in the tom yum soup of yesteryear? 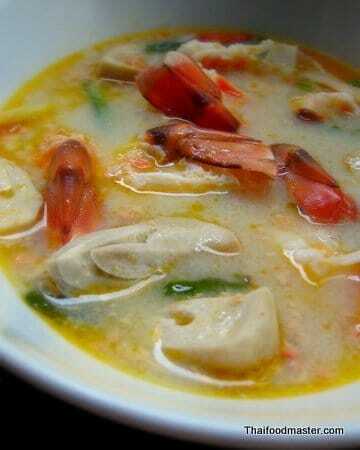 Or would its look and taste be alien to our modern perception of what authentic tom yum soup should be? Tom yum soup exhibits four clear flavors: unapologetic sourness, bold spiciness, and saltiness with notes of compromising sweetness. It has a playful citrusy aroma from lemongrass and kaffir lime leaves, accented with a pleasant scent of roasted chili jam. Tom yum soup, spicy red curry (gaaeng phet, แกงเผ็ด), sour curry (gaaeng sohm, แกงส้ม), sour soup (dtohm sohm, ต้มส้ม), and fermented fish soup (dtohm bplaa raa, ต้มปลาร้า) are just a few examples of dishes classified as aahaan bpra phaeht naam gaaeng (อาหารประเภทน้ำแกง), or “liquid-based dishes”; in English, we might refer to these as either soups or curries. The aesthetic quality of Siamese cuisine calls for a balanced meal with a range of dishes that reflect a spectrum of flavors and textures – all for the ultimate joy of eating. Salads, such as yam and pla (ยำ, พล่า), spicy and sour salads. Side dishes, such as vegetables and leaves, fried dishes, fried cakes, crispy noodles, grilled curries in banana leaves, steamed curries, stir fry curry and pickles (เครื่องเคียง, ทอดมัน, หมี่กรอบ, งบ, ห่อหมก, ผัดเผ็ด, ผัดพริกขิง เครื่องแนม, ผักดอง, อาจาด). An additional category is reserved for snacks (khreuuang waang, เครื่องว่าง); dishes consumed between main meals, in the afternoon or late at night before sleeping. 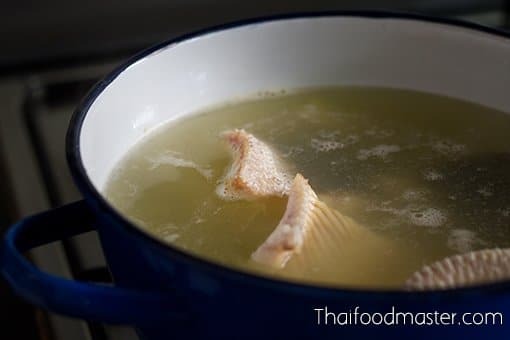 The two main tom yum types include the sharp and clear broth dtohm yam naam sai soup (น้ำใส), and the relatively newer arrival, a milky broth-like dtohm yam naam khohn soup (น้ำข้น), which came into popularity in the 1980s. A three-pronged base of lemongrass, galangal and kaffir lime leaves accounts for the aroma and the foundations of sour notes in both types of tom yum, which are further seasoned with lime juice and fish sauce, along with a generous amount of bruised bird’s eye chilies, and fresh herbs such as sawtooth coriander, coriander leaves and spring onions. Chili jam is only sometimes used in clear broth tom yum soup; whereas in milky broth tom yum, chili jam – together with evaporated milk or non-diary creamer powder – creates a velvety blanket that wraps the charismatic flavors into a smooth, soft broth. 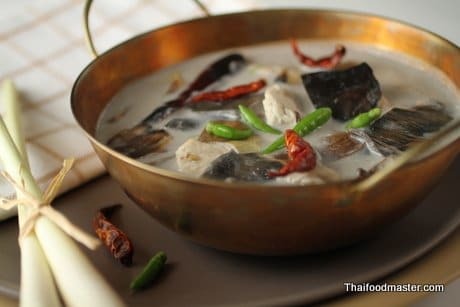 However, in late 19th-century Siam, tom yum soup was made with collected rainwater – to prepare a clear broth soup called dtohm yam naam thaa (ต้มยำน้ำท่า) – or with coconut cream, for a silky soup called dtohm yam gathi (ต้มยำกะทิ). The coconut cream-based tom yum nowadays is almost extinct, as the boundaries between tom kha soup (galangal coconut soup) and tom yum soup have become blurred. Back in the late 19th century, galangal and mushroom were not included in tom yum soup, and tom kha was not even a soup at all: it was a dish of chicken or duck simmered in a light coconut broth with a generous amount of galangal. 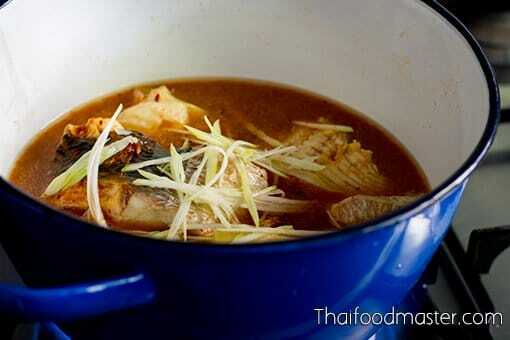 The coconut broth added sweetness to the meat, and the galangal helped to mellow the meat odor. It was then served with a basic roasted chili jam as a dipping relish, seasoned along the salty-sour-sweet spectrum. Today, lemongrass, galangal, kaffir lime, mushrooms with seasoning of fish sauce, lime juice and bruised bird’s eye chilies are used in both tom yum and tom kha. Nostalgic Thai food romantics can register their disapproval of new trends and practices on the culinary landscape, but the truth is that it is up to the many to dictate which recipe variation will retain popularity in generations to come – and which one will persevere, to shape the path of Thai cuisine. We can only hope that ancient Siamese culinary wisdom is preserved in the process. 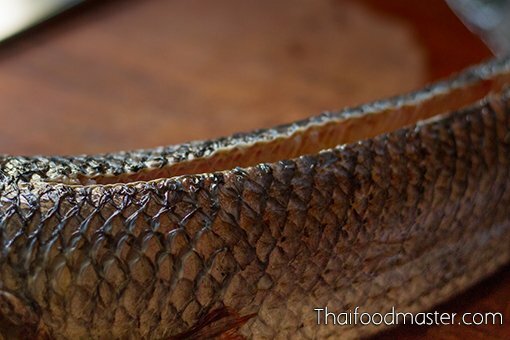 For example, in clear tom yum soups that include snakehead fish (dtohm yam bplaa chaawn, ต้มยำปลาช่อน), swamp eel (dtohm yam bplaa lai, ต้มยำปลาไหล), grilled tire track eel (dtohm yam bplaa gra thing yaang, ต้มยำปลากระทิงย่าง) or grilled stingray (dtohm yam bplaa gra baehn yaang, ต้มยำปลากระเบนย่าง), it was common to add a handful of uncooked rice grains to the boiling pot. This helped to both eliminate any fish slime and to thicken the soup; as well, it was believed that the rice countered undesirable harmful elements that could arise from the ingredients used. We observe this same practice in curries that utilize wild plants such as gaaeng phak waan bpaa (แกงผักหวานป่า) – a curry using the sweet leaves of the tree Melientha suavis Pierre – in which the rice is believed to help offset a toxin that can create headaches. 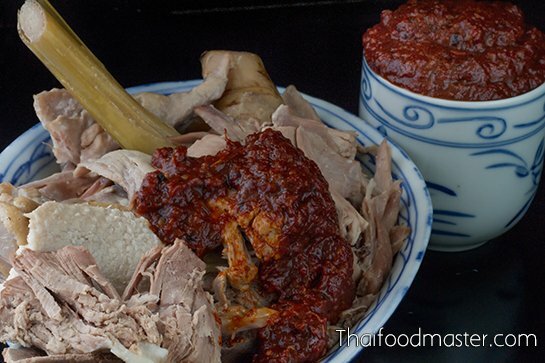 Chicken and ducks were popular in coconut-based tom yum (dtohm yam gathi, ต้มยำกะทิ) but if fish was used with coconut-based tom yum, no rice was added. 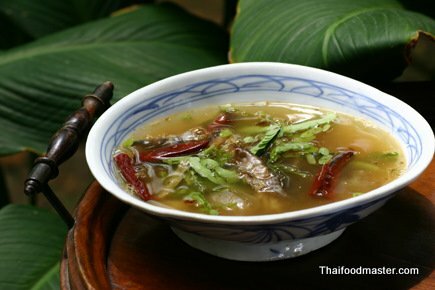 Pork, beef, and other small game meat, such as iguana or turtle, that were popular in older days were not used in tom yum soups. The roasted chili jam was also different. 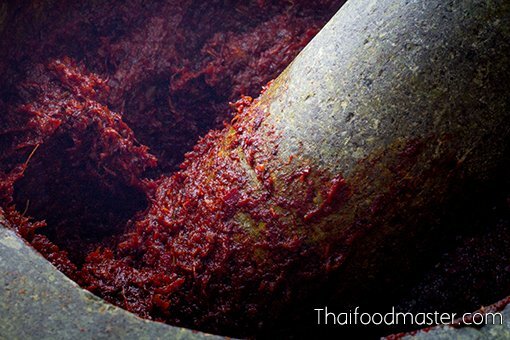 Comprised of dried chilies, shallots and garlic, which were char-roasted and pounded together with fermented shrimp paste, salt and coriander roots, the chili jam was then diluted with lime juice and added to the tom yum. This is a true roasted chili jam, lacking the oil of the modern preparation, which is more accurately referred to as fried chili jam. 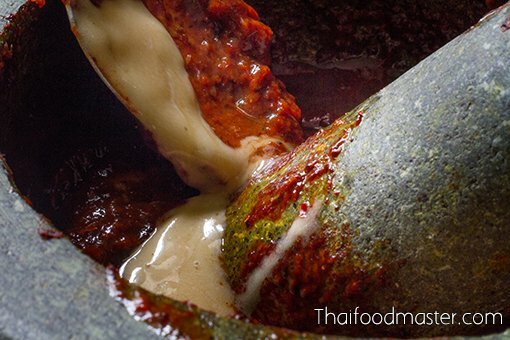 Flavor layering is an important practice in Thai cuisine. Therefore, wherever possible, a flavor is introduced using more than one source to ensure a multidimensional flavor profile. It used to be that shredded sour fruits were added to the tom yum soup, such as shredded green mango, the sour fruits of averrhoa bilimbi (dtaling bpling, ตะลิงปลิง) or even the brine of pickled garlic; this is no longer a common practice, perhaps because it is now easier to source limes throughout the year. 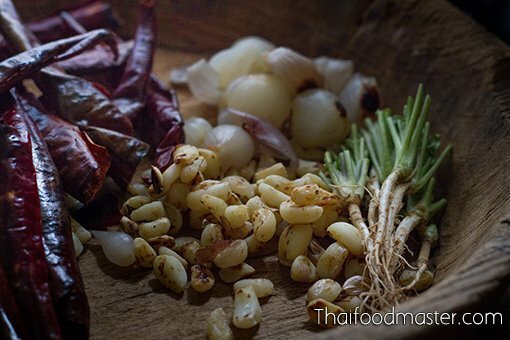 The final touch on ancient tom yum soups was with fried garlic and its oil, coriander leaves, and spring onions. These versions of old tom yum were popular among both commoners and the elite. What follows is a step-by-step recreation of tom yum soup with snakehead fish (dtohm yam bplaa chaawn, ตัมยำปลาช่อน) as recorded by Maawm Sohm Jeen (Raa Chaa Noopraphan) (หม่อมซ่มจีน, ราชานุประพันธุ์) in her book “Tam Raa Gap Khao” (ตำรากับเข้า), published in 1890 (2433 BE, 109RE). The recipe is very similar to the version presented by Princess Kasem Sanitwong (gaaeng dtohm yam bplaa chaawn, แกงต้มยำปลาช่อน), in the 1935 book “Sai Yaowapa” (สายเยาวภา จัดพิมพ์โดยสายปัญญาสมาคม) printed as a memorial book for Princess Yaovabha Bongsanid, the daughter of King Chulalongkorn, Rama V (พระเจ้าบรมวงศ์เธอ พระองค์เจ้าเยาวภาพงศ์สนิท). Princess Kasem Sanitwong was the granddaughter of King Rama II, and was also married to one of King Rama III’s sons. In her recipe, Princess Kasem Sanitwong calls for the addition of kaffir lime leaves when cooking the fish, and she further thickens the chili jam with ground-roasted mung beans and cooked fish meat separated from the fish tail. Both versions are seasoned to the order of sour-spicy-salty-sweet. 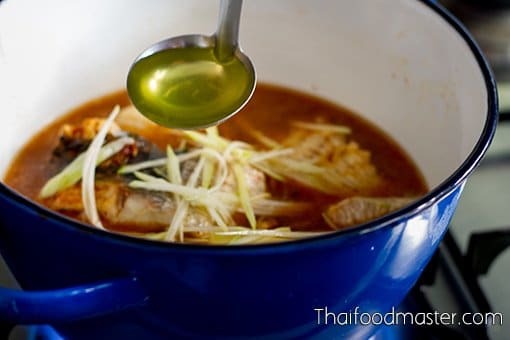 A a step-by-step recreation of tom yum soup with snakehead fish (dtohm yam bplaa chaawn, ตัมยำปลาช่อน) as recorded by Maawm Sohm Jeen (Raa Chaa Noopraphan) (หม่อมซ่มจีน, ราชานุประพันธุ์) in her book “Tam Raa Gap Khao” (ตำรากับเข้า), published in 1890 (2433 BE, 109RE). Char-grill the dry chilies, fermented shrimp paste, unpeeled shallots and garlic. Peel the shallots, and clean the coriander roots. Pound all the ingredients, with salt, into a consistent paste. Season with fish sauce, lime juice and palm sugar. Set aside. 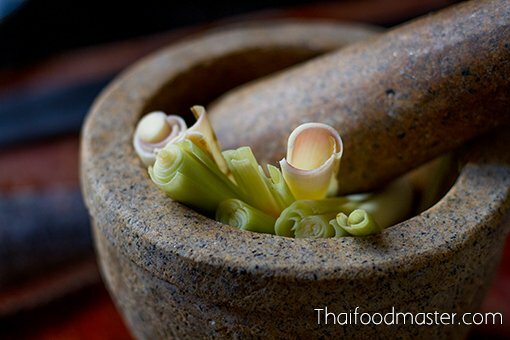 Bruise the lemongrass with a pestle and mortar. 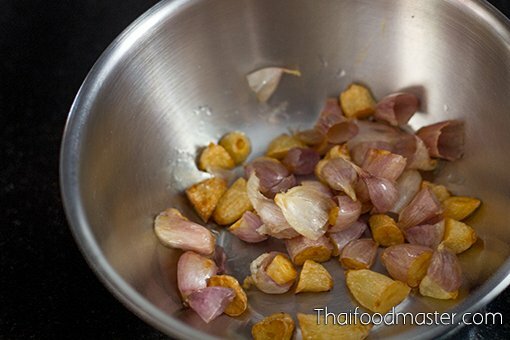 Fry unpeeled Thai garlic (whole cloves cut into halves) in hot oil until golden. Clean the fish, and remove the back bones. Cut the fish into three large segments. Split the head into two lengths, and clean thoroughly to eliminate all the slime. Set aside. 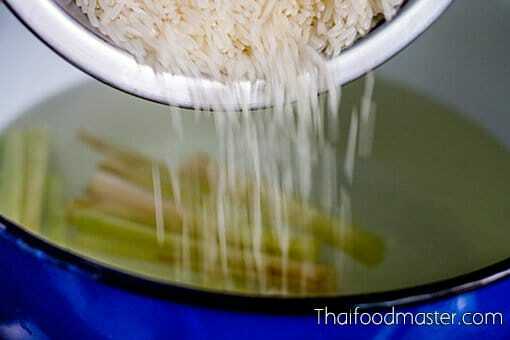 Place a cooking pot with water over medium high heat, and add salt, the bruised lemongrass and uncooked rice. Bring water to a strong boil. Add the fish to the boiling water, and cook until the fish is well cooked. Turn off the heat. Dissolve the roasted chili paste in the broth, and add shredded green mangos. Season with pickled garlic brine. 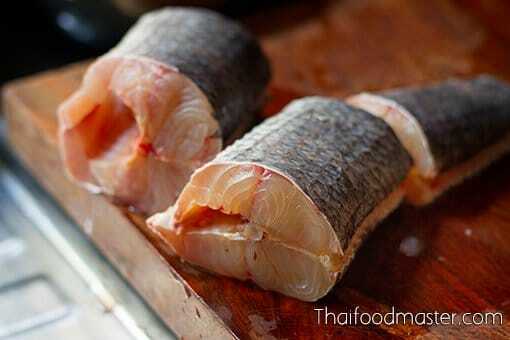 Season with fish sauce and add coriander leaves, the fried garlic and some of the oil to the tom yum soup. 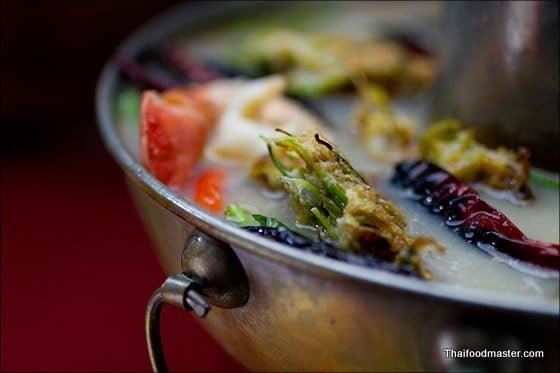 Tom kha is a well-known and much-loved Thai soup: a creamy, soothing coconut blend, a warm, silky broth in which chicken, mainly, is simmered with young galangal, mushrooms, and, at times, charred-grilled banana blossoms. In other versions, lemongrass and kaffir lime leaves are added, blurring the boundaries between tom kha and the coconut-based tom yam soup (tom yum kati; ต้มยำกะทิ). However, in the late 19th century, tom kha was not a soup at all: it was a dish of chicken or duck simmered in a light coconut broth with a generous amount of galangal. 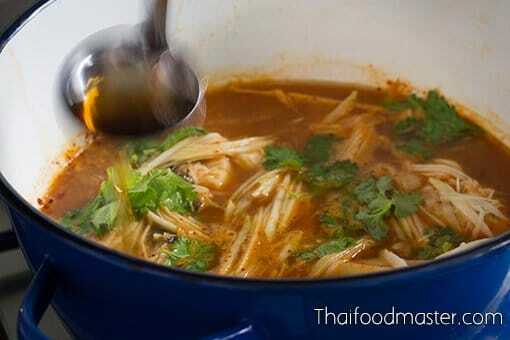 The coconut broth added sweetness to the meat, and the galangal helped to mellow the meat odor. It was then served with a basic roasted chili jam as a dipping relish seasoned along the salty-sour-sweet spectrum. 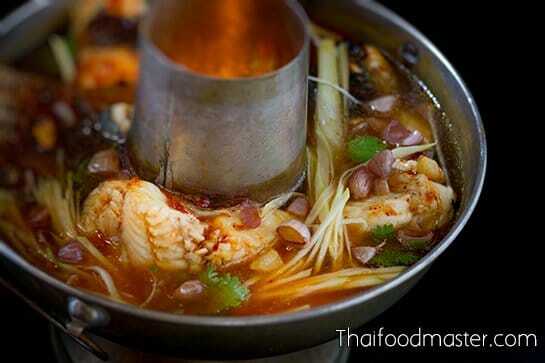 Tom Yam is a type of soup with distinct sharp hot and sour flavors, scented with pleasant citrusy aroma. Tom Yam is known to seduce many westerners to fall in love with Thailand, its people and food. Many trips memories to Thailand were written in diaries, others are etched on film but all are stained by the Tom Yam charm. I still remember with vivid colors my first bowl of Tom Yam, in the night market of the old neighborhood on a hot night in a ragged, unfashionable part of Bangkok. Where the smell of cooking and the glare of florescent lights decorated the alley where JeMoi used to own a restaurant, a very simple and very good one, decorated with cheap bamboo chairs and peeling orange walls. I would enjoy watching the streets of the early night turning into mornings, eating, drinking and sweating. It was hard to say if I was sweating from the hot and humid weather, the cheap whiskey or JeMoi’s spicy food. I still smile when I think of her, standing by my table with a winning smile, as if she knew how much I enjoy the food. It will not be an overstatement to say that banana trees accompany Thai people from their birth to the afterlife. Starting with the decorative objects made out of banana leaves newborns receive to invite protective spirits, and continues their entire life with the endless uses for banana leaves, trunks and fruits; finally ending with the female spirit ghost, maae praai taanee (แม่พรายตานี), who resides in banana trees and Thai beliefs. Here is a rustic sour soup recipe that is very light on ingredients. 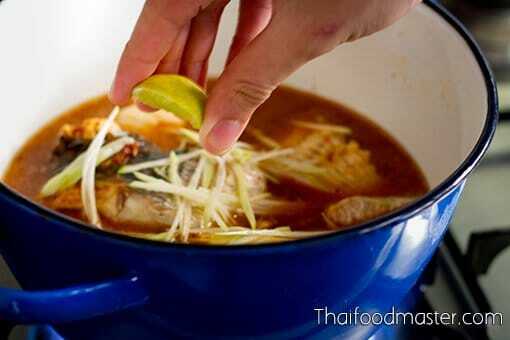 The broth is made by boiling dried smoked and lightly grilled freshwater fish. It is seasoned to the sour spectrum of the palate with the use of no more than tamarind. Semi ripe tamarind fruits were used in the early days as tamarind trees were grown in the backyard of almost every Thai home but tamarind water and leaves will just as well work a treat.